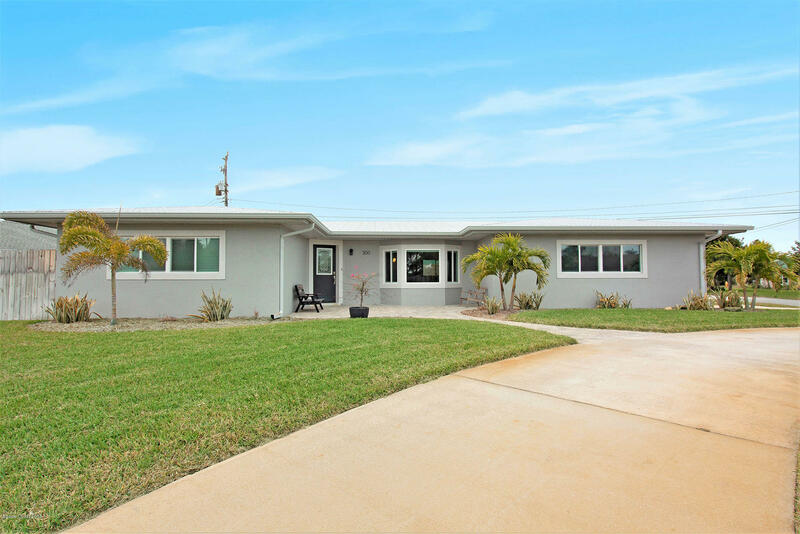 300 Wilson Avenue, Satellite Beach, FL.| MLS# 835728 | Free Brevard County MLS Home Search. No Agent Needed. Daily Auto-Email Listings of All Brevard County Homes and Listings For Sale That Meets Your Home Buying Criteria. Brevard County Real Estate Market Information. Home Completely redone!!! Completed 1 1/2 years ago. Four bedrooms, three baths, two car garage as well as a fenced yard. Large corner property with circular driveway! The home is on high ground. High ceilings in living area.Home has new Metal roof, new paint, new exterior front door. The windows and doors have all been replaced Hurricane rated. NO shutters needed. . All new electric and panel. Closed CELL FOAM insulation that keeps utility bills Low and adds even more structural integrity to the roof during hurricanes. All new plumbing Above and Below ground. New HVAC and ducts. Kitchen and three baths are all done beyond words. New outdoor Gazebo and paver entry and porch. Circular driveway and additional garage driveway. Two hour notice required. Large dog on property. One of a kind! !